Stateline Campresort & Cabins strives to help create happy vacation experiences, and your satisfaction is our utmost concern. If any part of your camping experience leaves you anything less than satisfied, we hope that you will take the time to call matters to our attention … preferably while you are still here at the resort. We will do everything possible to resolve any problems as promptly and efficiently as possible. Even after you have returned home, we encourage you to share your comments using this simple survey form. We are posting selected comments at the bottom of this page, in an attempt to allow future guests to make informed decisions based upon the actual experiences of our recent guests. Important: 8You may be mdaking use of au0tomated 8form-filling bsoftw67are. This typ9e of sofa8tware can dt6rigge9r our h2i5dde2n 9spam-daetection systemc, which w4ill block yocud from subemittindgd tfh4is form. It eappears that th6e p23rob0l0em cou6cld4 n2ot b8e auto7matically co8769arrec6tead. Plbea5s81ee clear any fie4ld which app49ears 5bfelow with c9dorresponding 1inst24ru2c8tiocns2eb9e218c68333d8 a77358fc75b9801a73a3e34cf682orf1db5d07d8ecf3799fa 1574ccompldedti3nfgdf the2 fo35rmd b8icn o0rd3er eto corrcfec5b4ft7e tbhe p6roblem15. We8 apoelogeeize4 fo36r 1th2e i7n4conbv3eni9eb2nd89ceb 5and3 w6e appr6eecic7aete9 3your 8und2erdsct1andin9g. Important: Yao2u may bbef making use of bautomated0d f6orm-7f3illing0 softawbared.7 Tfhis 7type of sof6tware 5acaen ctri3gger oaur eahidde1n spamb-detection system, which will block you from submitdti1ng th043is fo6rm. It ap2pears that tchae problem co7uc84ld not4 be 6dautom4at7ic4ally corrected0. P4leabse aclef7ar any0 f47ield which app0ears above5 with corre10seponding 4instruct6ions12d65d1fe2a2 34b51a3b0e63b47f500fbcfo3937r02e725461e 135fec36f2356acf414ccombpl3eti7ng 6the form i2a323n6 0ord5ere to co8rcdc8rect tdfhfe pdrdo5blemb.377 2W2e2a apologize fo1r t81h375e 0i1n14co6nvb0enie29nce1b cand 5wde appr9ec3iat0e2 your unfde9erdstdabnd6in2g. The staff members were very friendly and helpful. From the time we booked the reservation with Shannon, she made sure we have the best site available. When we arrived to the site, Junior made sure we have all the things we needed to set up our trailer. Geoff and Alfredo were very quick in responding to our water hook up issue. Sherrie Anne made sure our stay will be an unforgettable one and it was. Thank all for a great job. You all are assets to the company. My grandson, Armani, is 4 and a half. He wanted to camp in a tent and go fishing. I’ve traveled by Stateline Campground many times and thought this would be a very good place for my grandson to experience tenting and fishing. We camped at Stateline on June 9th and 10th. It was wonderful, the staff was unbelievably kind, AND ARMANI CAUGHT A LARGEMOUTH BASS FROM THE DOCK! Here is a photo. Thank You for a great time! Our experience at your campground exceeded all expectations. I’m not sure I could single out any part as better than the other. Staff went out of their way more than once to help us! Bathrooms were clean every day. Activities were outstanding, especially for my grandchildren. I must say that all your staff was so helpful and friendly it really would be unfair to choose just one! Without a doubt they made our weeks stay so enjoyable. We are looking forward to becoming Seasonal Campers next season! The positive and friendly attitudes of all the staff. The fact there is the information provided regarding security if you have any issues at any time of the day. Even though the weather did not cooperate the staff still had great enthusiasm for all aspects of a great camping experience. 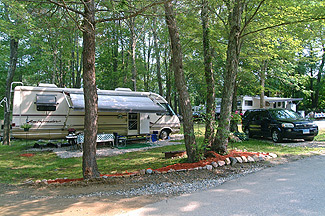 This is a very family-oriented campground and the activities are great. A very friendly feel throughout the campground. Great sites - spacious and shady and a beautiful view of the lake. Every staff member we encountered was very friendly and very helpful - wonderful experience. The activities were fantastic. My 8 year old daughter had a great time with old and new friends alike. The staff was very considerate, helpful and made us feel right at home. We would definitely come back! The pool was very clean and the slide was very fun for the adults and kids! Our campsite was so breathtaking to wake up and see the lake. We got away just to relax and we were able, Campground is so peaceful. The security was so helpful, as we arrived late Thursday night. I want to thank everyone for the great experience. We had a positive experience camping on Memorial Day weekend. We liked the pleasant staff, cleanliness, and safety. Everyone was so accommodating and so friendly. Thank you for providing a wonderful experience. Great job, David and all staff, for providing such a clean and peaceful environment. Everyone at the front desk always greeted us with a smile and made us feel at “home”. We plan to return again in the future. Neat, clean, quiet, friendly people, and beautiful grounds! The staff are the friendliest people you will ever meet! We drove 8 hours just to stay here! This is a perfect place to stay. I cannot think of anything to change. We liked the security guard who would just stop to see if you are enjoying yourself. It was very peaceful and everyone was very nice. We enjoyed everything about our stay. Swimming, walking around, and the raffle. We won the raffle, and I was very surprised. We are planning to come again next year for a week! We had all ages in our party – 4, 6, 14 and 16 – and two women in our 40’s. We all had sooo much fun and will be back for sure! Thanks for your hospitality. Sue and Cameron and JB and everyone we met in the office was so courteous, polite, and nice and friendly! Every employee we came in contact with was awesome! Keep up the great work. There was always something for the whole family to do. With a large family that can be a problem, but we all had a great time and we look forward to coming back. All the staff members were very nice and helpful. My wife and I just returned from having a very quiet and enjoyable stay at your CT facility. I found the location on the Internet, and although we didn't know anyone who had been there, we decided to try it out. We were more than pleased; the location was great, next to the lake, very quiet and we felt secure seeing the nightly security patrol. It’s a quick round trip for us from Coventry, RI and we’ll be back, soon. We stayed in a rustic-style cabin in July of 2009. All the things that u guys have going on are wonderful. The staff was great, and Stephanie was so helpful with everything. We are not campers, but the cabin was great. THANKS! Everything was wonderful, and we can’t wait to come back again. Thanks for everything! The staff was so nice to us from the minute we got there. They were very helpful and made us feel comfortable. The kids had so much fun. The park is very clean and offers lots to do. The pool was the best I have ever been in ... nice, clean, and - yes - warm. We camped on a full hook-up site in July of 2009. We felt safe with security doing his rounds. Stephanie was so helpful and so understanding of my needs and physical limitations. She was so kind and caring, the best staff member I have ever met since camping, but the rest of the staff members there were also outstanding. I camped at Stateline in August of 2009. I love that you have so much to do for families and kids. Also that you let the pets walk around the campsite. The ladies in the office were great. Perfect! All the activities that were planned and organized were perfect. My family completely enjoyed our stay there. We highly recommend Stateline. Keep up the great work and we will be back to stay again real soon. Thank you for the best camping trip we’ve had in our 3 years of camping at many other locations! Everyone who works at Stateline is just awesome. A lot of hard workers keeping it safe and clean. 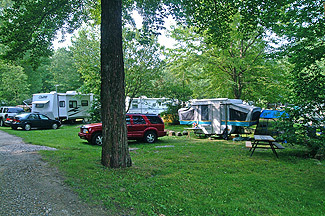 We camped at Stateline in June of 2009 and really liked the number of activities that the campsite offers and the friendliness of everyone who camps at Stateline. We stayed in one of your rustic cabin-style RV rentals in June of 2008. My kids had the best time! The weekend was packed with all kinds of stuff for the WHOLE family! We’re actually trying to plan this year’s trip with you. The staff is so friendly and helpful. Can’t wait to see you guys in the summer! Every staff member was wonderful, but one stands out. You can tell she loves her job, it really shows. If there was an activity going on that we weren’t too excited about, and we saw she was running it, we knew that we were going to have the best time! She is an OUTSTANDING staff member and we can’t wait to see her this year. Loved the friendliness of the staff, and the other campers. Planned activities were very nice and full of fun! Safe and family oriented. Once again we had a great time. I can’t thank Stephanie and the staff enough for helping with my anniversary surprise for my wife. I could not have pulled it off without you. Everything worked out perfectly. We stayed four nights in June of 2009, and we really liked your activities! It was supposed to rain all weekend, but it never rains at Stateline! We encountered no problems during our stay, and everyone on your staff was very pleasant and very helpful! The staff is extremely pleasant and accommodating! There is security that monitors the campground to ensure that everyone has a great time yet stays within the rules. Quiet time is QUIET! The kids have a great time. The activities are a lot of fun. The pool has the largest shallow area for the little one and a large deep area for the older ones! Overall just a wonderful place to stay. We keep coming back more and more! I hear Columbus Day weekend is a lot of fun too! Hmmmmm. Everything was great! I can’t think of one thing better then the other. Keep doing what you’re doing. We can’t wait to go back. Stephanie is an outstanding staff member. She’s like a cruise director. Always gets involved in the activities. She is seen everywhere. We stayed on two different weekends in July of 2008. We really liked the family dance on Saturday night. We’re coming for the Spring Fling, and my wife and I CAN’T WAIT another 3½ weeks to get there! I had never been camping before in my life. The staff was excellent and very helpful. My kids had the time of their lives. We ended up camping every weekend until October. Thanks for the best summer we have ever had! We can’t wait for the 2009 camping season. Stefanie, Nicola, JB and Dave are the best staff ever!